Networks will have to wait a few months longer for full access to Nielsen's new Total Audience Measurement data, but in the interim, the company is preparing to share more information about usage of connected TV devices like Roku and Apple TV. 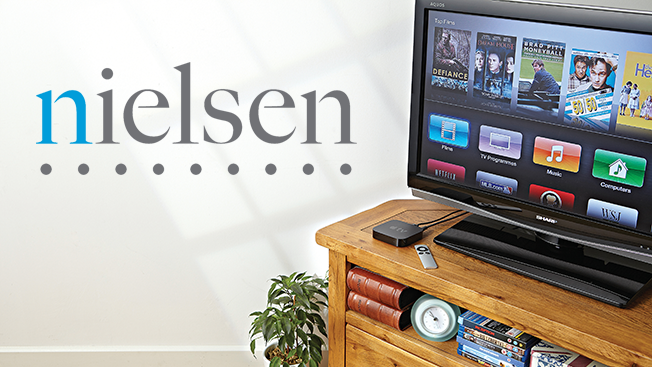 Nielsen announced today that beginning April 25, it will make brand-level data available from connected TV devices, including streaming video devices and game consoles—Roku, Apple TV, Amazon Fire TV, Google Chromecast, Xbox, Sony PlayStation and Nintendo Wii—as well as enabled smart TVs. This will allow clients to track how many homes across the country own TV connected devices and which brands, and how those numbers grow over time. Clients will be able to determine how much time people spend with devices overall and link program viewing to those specific devices. The company is also creating a new metric called Total Use of Television (TUT), which adds connected TV usage to linear usage for what Nielsen calls "a complete view" of TV usage. "Our device breakout data will report how much viewing to a particular network, program, episode or telecast came from a particular device type or device brand for measured content," said Sara Erichson, evp, client solutions and audience insights. Erichson explained that many networks already have content measured by Nielsen coming through these devices. "Take, for example, the case of someone watching live TV on an Xbox," she said. "Today, this viewing would be added to a network's ratings, but no one knows how much of the overall viewing to a program is coming from that Xbox. Beginning next month, clients will be able to associate the portion of the viewing that is coming from individual brands of connected device." For SVOD programming of older episodes (i.e., shows airing on Netflix, Hulu and Amazon), clients who are already signed up for SVOD measurement will be able to associate that viewing with specific brands of connected TV devices. While April's rollout will pair connected devices with TV sets, Erichson said, "The next phase is identifying what apps are being accessed on these devices to get the content." She also noted that Nielsen already incorporates viewing from certain streaming devices—like CBS All Access—into its ratings. The brand-level TV connected device data will be available on a subscription basis only, but the Total Use of Television metrics will be available at no charge to clients, Erichson said. The data comes from Nielsen's TV panel, which the company recently doubled from 20,000 to 40,000 households for a total of 100,000 viewers. The panel includes more than 100,000 TV sets and more than 50,000 connected TV devices. It will also be included as part of Total Audience Measurement, the multiplatform measurement tool the company is in the process of rolling out. While individual networks and clients can currently see their own total audience data, Steve Hasker, global president and COO, told Adweek in this week's issue that the public rollout (when "everybody sees everything") has been delayed at least three months, to the end of the second quarter at the earliest. Nielsen said that today's data announcement has been in the works for some time, and isn't connected to the delay in Total Audience Measurement's rollout. "I think it's the reality of working through the data with clients, getting them comfortable with the new data sets that they're seeing," said Hasker of the total audience delay. "That process … I don't know that we underestimated it, but we can never spend enough time with our clients analyzing that data, helping them understand it and figure out what sort of decisions it's going to lead to." The Total Audience Measurement metrics include almost all of the ways people view content: VOD, DVR, mobile, PC, tablet, connected TV devices (like Xbox, Apple TV and Roku), and linear TV. When those other platforms are factored in, said Hasker, "We're seeing in some cases audience lift of around 50 percent, but on average, we're seeing an audience lift of around 10 percent."